The Umpqua River Bridge has two 154 ft long reinforced concrete bow string arch spans on each side of a central, 430 ft long steel through truss swing span. It's the longest swing bridge in Oregon, one of only five still on the State highway system, and of historical significance for the technology it uses. This bridge was built in 1936 by Teufel and Carlson of Seattle and designed by Oregon's chief bridge engineer, Conde McCullough. 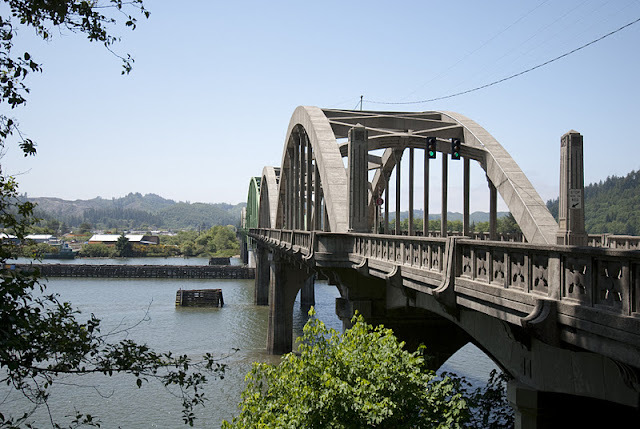 As you may have noticed, the Umpqua River Bridge is just one of several monumental bridges built along Oregon's coast (on US 101) and completed in 1936 as part of the Oregon's Coast Bridge Project. The swing span was built to allow the passage of tall sailing ships that were once common along Oregon's coast and the Umpqua River. This bridge was added to the National Register of Historic Places in 2005. Note the unusual barrier rail with concrete pylons at the ends of the bridge. Like yesterday's Siuslaw River Bridge, the Umpqua River bridge is located several miles from the mouth of the river because a huge sandbar (the Oregon Dunes National Recreation Area) is along the coast. I may as well mention that the Cascadia Subduction zone also runs parallel to Oregon's Coast. It produced a huge earthquake and tsunami in 1700 and is expected to produce another large earthquake every 300 to 600 years. The worst-case scenario would be that the earthquake would damage bridges, preventing people fleeing the coast from reaching higher ground when the tsunami waves strike the coast. However, the state of Oregon should be credited for developing tsunami evacuation routes all along the coast. Oregon's Bridges: Umpqua River Bridge by Mark Yashinsky is licensed under a Creative Commons Attribution-NonCommercial-ShareAlike 3.0 United States License.